The flagship Topps baseball set is, traditionally, the most collected set of the year for a reason. A big one is the price. Compared to most every other current set, it's cheap. Fresh out of the gate, you can grab packs for a couple of dollars. Wait a few months and, once the dust settles, you can expect to pay even less. But just because buying in is (relatively) cheap, it doesn't mean some rare and high-end cards can't be found. You need a some luck, but they're out there. But it looks as though the odds might be a little more in your favor with 2014 Topps Series 1 Baseball than in years past. 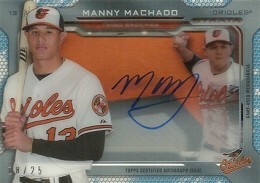 While still rare, there appears to be more autographs and hit-focused cards in the flagship product. These are the types of cards that garner the most attention on the secondary market. Because of the product's tradition and widespread appeal, a lot of these cards quickly make their way into personal collections and master sets adding a little urgency to get while they're available. Early on, some of the cards getting the most attention in 2014 Topps Series 1 Baseball are the Strata autographed memorabilia cards. After debuting in 2012 Topps Strata Football, the shadow box-style cards have made their way to the diamond. Most are redemptions, unfortunately, but a couple are live. The combination of novelty, quality and "cool factor" have been generating a lot of buzz. As with past years, World Series relics and autographs are enticing team collectors, particular fans of the Red Sox. Even players who typically don't sell for much command a premium in these sets. Of course, there are also the plentiful variation short prints. With so many of them to chase, collectors are looking for them for player collections, sets and holding onto them for the novelty factor. Below is a real-time list of the most-watched 2014 Topps Series 1 Baseball cards currently listed on eBay. While not all are the ones getting the highest bids, it does offer a gauge of what is drawing the most eyeballs and attention. The list will refresh on its own, so you may want to check back if you're tracking a particular card, insert set or just curious about what's happening with the popular release. 2014 Topps JOSE RAMIREZ Cleveland Indians Red Foil # 424 Rookie Card RC. 2014 Topps Tek CHRISTIAN YELICH On Card Certified Autograph -BREWERS SUPERSTAR! 2014 Topps Mike Trout Commemorative Class Ring Angels MVP Superstar! 2014 Topps Series 1 Baseball Hobby Box - Factory Sealed!